This is a reprint of a “From the Local History Room” column that first appeared in August 2012 before the launch of this weblog. Over the years this columns has from time to time spotlighted a few of the scribes who played important roles in recording the early history of Pekin and Tazewell County: writers and researchers such as William H. Bates, Charles C. Chapman, and Fred Soady, or Pekin’s pioneer photographer Henry H. Cole. This week we’ll take a closer look at the life of another important Tazewell County historian, Ben Campbell Allensworth of Pekin. Allensworth’s chief contribution to local history was as the editor of the 1905 “History of Tazewell County,” which updated Charles C. Chapman’s 1879 history. Allensworth’s history was published in the “Historical Encyclopedia of Illinois and History of Tazewell County.” The first volume and part of the second volume, the encyclopedia, were edited by Newton Bateman and Paul Selby, while Allensworth was in charge of the Tazewell County history in volume two. Allensworth was well suited to his task, because he was a school teacher and superintendent as well as an experienced and accomplished journalist. As the old saying goes, journalism gives us the first draft of history — but Allensworth had a hand in both a first and second draft of Tazewell County’s history. This portrait and signature of Ben C. Allensworth was included in the 1905 “History of Tazewell County” of which Allensworth was the editor. Included in Allensworth’s Tazewell County history, on pages 968-970, is his own biography, written by his friend, Judge A. W. Rodecker. “Ben C. Allensworth, the editor of the History of Tazewell County, having, from some cause, failed to furnish his own biography to the publishers of this work, they asked me to write it,” Rodecker apologetically explains. Allensworth’s portrait also is interleaved between pages 682 and 683. Rodecker’s biography of Allensworth says, “Ben C. Allensworth was born in Little Mackinaw Township, one-half mile southeast of Tazewell, in Tazewell County, Ill., October 27, 1845. His parents were William P. and Arabel Waggener Allensworth. William P. Allensworth was born in Muhlenberg County, Ky., September 25, 1820, and died in Minier, Ill., May 8, 1874. He was a kind hearted and courtly gentleman, and highly esteemed by all who knew him. He held the office of Clerk of the Circuit Court for four years, and was an efficient and popular officer. The mother of B. C. Allensworth was born in Christian County, Ky., July 9, 1827, and died in Galesburg. Ill., March 25, 1902. She was a woman of culture and refinement, anxious for the success of her children, and labored with her husband in his every endeavor to educate and make them good and useful citizens. “The subject of this sketch was the eldest of nine children, all of whom, with the exception of two, are living. He was reared on a farm, but, when he could be spared, attended the country schools and was a diligent pupil. It was easy for him to master the studies taught, and he early evinced a purpose to be more than a common school scholar. At the age of twenty he entered the State University at Normal. He ranked high in his studies, and when he graduated in 1869, left a record in the school which gave him a high standing with the school men of the State. 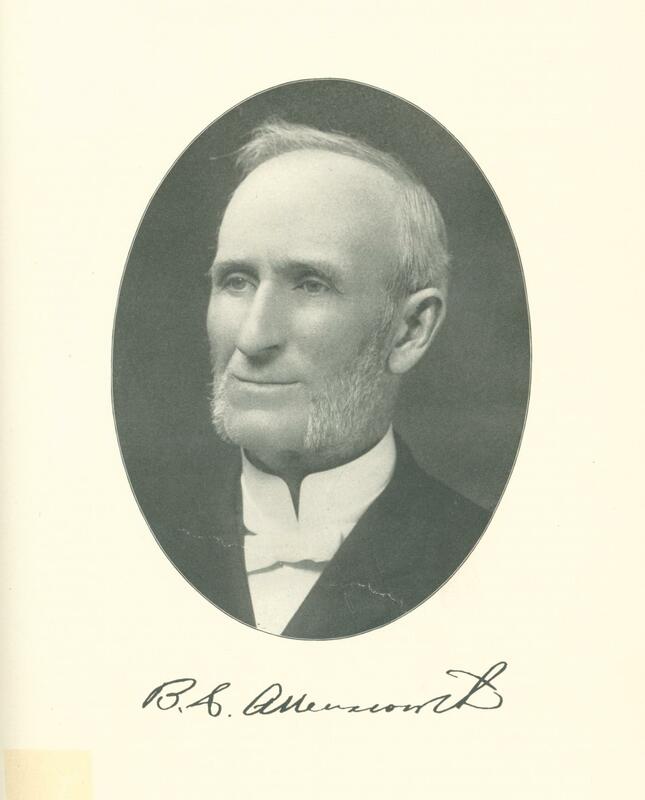 Soon after his graduation, he was appointed to the position of Superintendent of Schools in Elmwood, Peoria County, which place he held until the spring of 1872. . . .
“In April, 1872, Mr. Allensworth bought of W. T. Meades a half-interest in ‘The Tazewell Register,’ and connected therewith John F. Mounts, a printer and writer of some considerable reputation. In September of that year, Meades purchased Mounts’ interest in the paper. The partnership of Meades and Allensworth, in the publication of the Register, continued until January 1873, when, on account of failing health, Mr. Allensworth sold out to Meades. Then retiring from the newspaper business, he went to farming in Little Mackinaw Township. He taught school in the winter time until 1877, when he was nominated by the Democratic party for Superintendent of Tazewell County Schools, being twice elected to this position. . . .
Rodecker also states that Allensworth married Charity A. Tanner in Minier on Oct. 7, 1875. He and Charity had three daughters and two sons. Charity died in 1912, and Allensworth died at Pekin Hospital on the morning of Sept. 3, 1929, being survived by three of his children and four grandchildren. His lengthy obituary — which is mostly a somewhat abridged version of Rodecker’s biography — was published at the top of the front page of that day’s edition of the Pekin Daily Times. He was buried in Greenwood Cemetery in Little Mackinaw Township. Our nation this week marked the 77th anniversary of the Empire of Japan’s sneak attack on Pearl Harbor on Dec. 7, 1941, that triggered the United States’ entry into World War II on the side of the Allies. From that point until the unconditional surrender of Nazi Germany and Japan in 1945, the entirety of America’s military, industrial, and spiritual might was committed to the war effort. By the war’s end, the U.S. had lost over 400,000 soldiers in a global shedding of human blood that included anywhere from 21 million to 25.5 million military deaths, 29 million to 30.5 million civilian deaths due to war or to crimes against humanity, and another 19 million to 28 million civilian deaths due to war-related famine and disease. The horrific human cost of the genocidal aims and expansionist ambitions of Germany, Italy, Japan, and the U.S.S.R. was an estimated 75 million to 85 million souls. Most fittingly, the generation in America who bore that terrible burden of suffering, and who afterwards exerted themselves to rebuild and repair their broken world, has come to be known as “The Greatest Generation” (a title bestowed on them by retired NBC anchorman Tom Brokaw). With the blessed conclusion of that conflict receding further and further into the past – it’s now been more than 73 years since the end of World War II – each day that passes there are fewer and fewer men and women left to tell us of their experiences. These were the fathers and mothers, the grandfathers and grandmothers, and great-grandfathers and great-grandmothers of the current generation. My own father, Joseph, is one of them – but he wasn’t old enough to be drafted until December of 1945, so he avoided all the fighting, instead spending what he says was the most boring year of his life in the U.S. Army’s peacekeeping forces near Manila in the Philippines. How stark is the contrast between his experience and that of those who had liberated the Philippines from Japanese occupation a year before – not to mention the experience of his older brothers who fought in Europe and the Pacific. 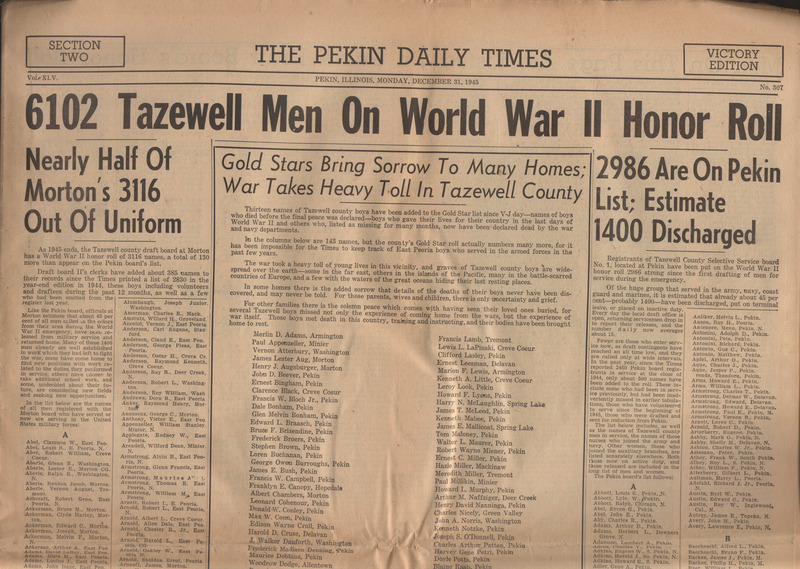 On Dec. 31, 1945, the Pekin Daily Times published a special “Victory Edition” that presented extensive lists of the men and women of Tazewell County who had served their country during World War II. It is to help us to remember those times that the Pekin Public Library has provided opportunities this year to view oral histories such as “We Were There: World War II” (shown earlier this year on May 4) and “World War II POW Stories’ (originally scheduled for Friday, Dec. 7, at 11 a.m., but instead to be rescheduled to a time following the completion of the library’s repairs). The library has a wide area of books and videos on World War II in its circulating collection. The above mentioned videos, however, are just two items among the resources related to the history of World War II that may be found in the library’s Local History Room Collection. Two of those volumes were the work of the late Robert B. Monge of Pekin, who in 1994 authored and edited “WW2 – Memories of Love & War: June 1937-June 1946,” a hefty 991-page book that collects personal stories, newspaper reports, and obituaries of Tazewell County World War II veterans and fallen heroes. Three years later, in 1997, Monge collaborated with Jack Shepler and the Tazewell County Veterans Memorial Committee to produce the 261-page “Book Eternal: Tazewell County Veterans Memorial,” which tells of the planning and construction of the county’s Veterans Memorial located at the Tazewell County Courthouse lawn in downtown Pekin. “Book Eternal” also lists those whose names are inscribed on the memorial’s stones, which display the names of every Tazewell County soldier who died in the service of his country. 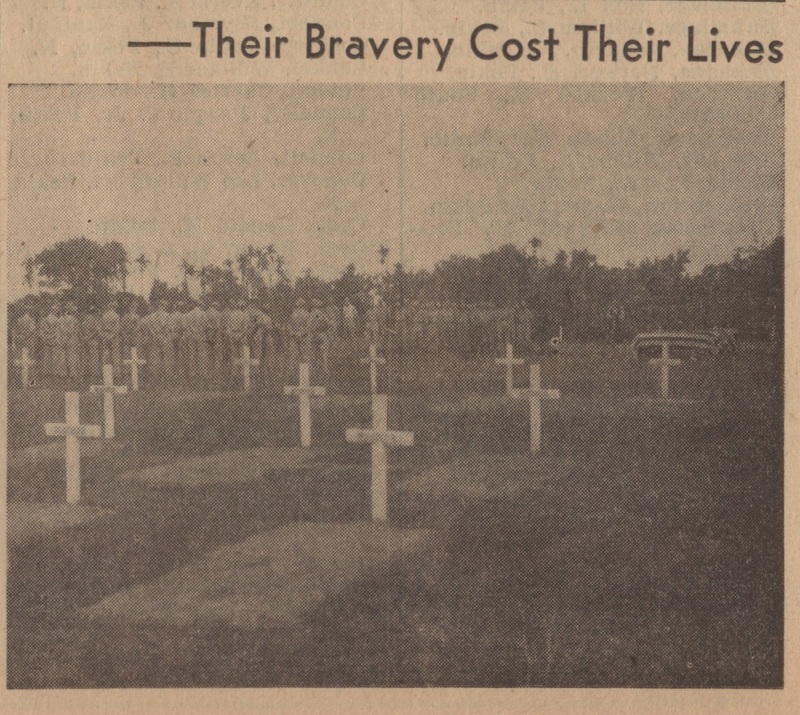 This photograph from the front page of the Pekin Daily Times’ “Victory Edition” on Dec. 31, 1945, reminded readers of the bravery and sacrifice of the soldiers who had been killed in World War II. A decade later, in 2007 the Tazewell County Genealogical & Historical Society compiled its own book on the experiences of our local World War II veterans: “Tazewell County Veterans of World War II: Remembrances – Pearl Harbor to V-J Day,” which extends to 488 pages. The Local History Room Collection also has archival boxes and files of newspaper clippings and World War II-era magazines, and even several donated complete issues of the Pekin Daily Times from those years. One of those newspapers is the “Victory Edition” of the Pekin Daily Times, published Dec. 31, 1945. The Daily Times that year devoted its traditional “Year In Review” issue to a look back over the nation’s and Pekin’s experiences of the previous four years, preparing and publishing a list of 143 young men from Tazewell County who had been killed in the war, along with extensive Draft Board lists of names of men from Pekin and Morton who been called up to serve their country, including the county’s women who had volunteered as Army and Navy nurses. Section Two of this special edition is headlined, “6102 Tazewell Men On World War II Honor Roll,” with other headlines including, “Nearly Half of Morton’s 3116 Out of Uniform” and “2986 Are On Pekin List; Estimate 1400 Discharged.” A separate story, “62 Tazewell County Women Serve Country,” is devoted to the honored group of women who had volunteered as WACs (Women’s Air Corps), WAVES (women in the Navy), SPARS (Coast Guard auxiliary), and the Marines women’s auxiliary force. In keeping with what Bob Monge wrote, may we never forget the men and women of that generation whose names are, or soon will be, written in God’s Book Eternal. The opening of Illinois’ Bicentennial Year A.D. 2017-2018 was marked across the state last winter with formal ceremonies in which local governments raised the official State Bicentennial flag. The chief flag-raising for Tazewell County took place on the Tazewell County Courthouse lawn, in a ceremony organized and presented by the Tazewell County Illinois Bicentennial Committee. Since then, the committee, made up of representatives of local communities and organizations, has continued to meet on a monthly basis to help with the ongoing celebration of the Bicentennial in Tazewell County. Among the events gearing up for the celebration of Illinois’ 200th birthday this December was an Illinois Bicentennial Tea, presented May 12 at the Pekin Park Pavilion by the Tazewell County Museum and the Pekin Woman’s Club. The event was attended by about 30 people, who listened to a historical address by Stu Fliege, director of the Illinois State Historical Society in Springfield. One of the committee’s projects has been the construction of an online historical StoryMap of Tazewell County, an initiative of the Tazewell County Board. Janna Baker, Tazewell County geographic information system coordinator, has been at work on the StoryMap, adding the locations of county historical sites along with information about them that she has researched or that committee members have provided. 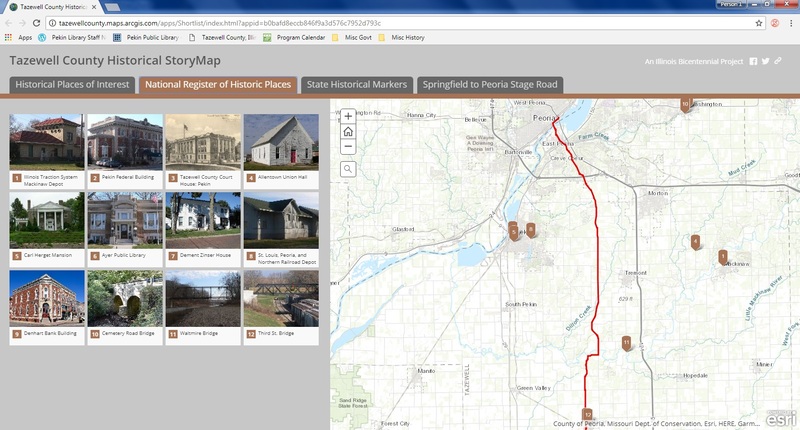 The sites on the Tazewell County Historical StoryMap are organized under four page tabs: Historical Places of Interest, National Register of Historic Places, State Historical Markers, and the Springfield-to-Peoria Stage Coach Road. 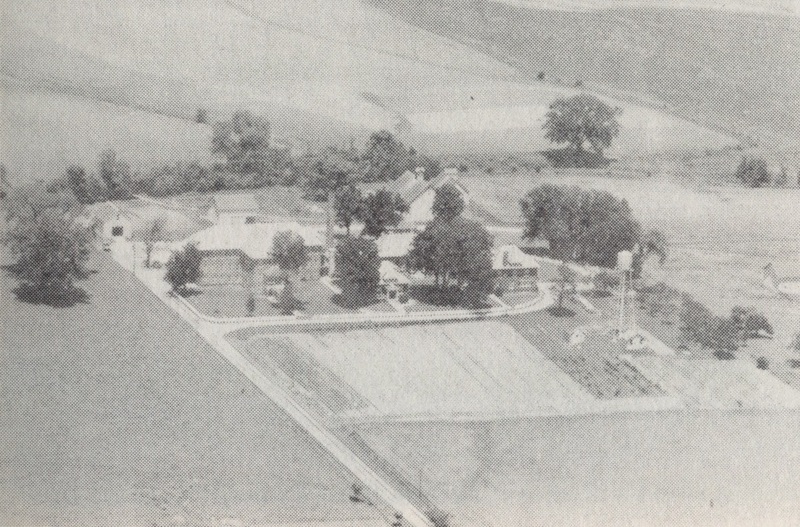 The Historical Places of Interest range from the sites of the county’s first courthouse in Mackinaw and the old French trading post in Creve Coeur early in Tazewell County’s history, to the location of the Little Mine Riot and the nation’s first Vacation Bible School (both of which happened in 1894), to the former Springlake Clubhouse (where infamous Chicago gangster Al Capone is said to have gone hunting) and the Deer Creek-Mackinaw Middle School World War II memorial. The average Tazewell County resident is probably unaware that the county has 12 structures on the National Register of Historic Places, including the Old Post Office, the Tazewell County Courthouse, and the Carl Herget Mansion in Pekin, the Dement-Zinser House and Denhart Bank Building in Washington, and the Waltmire Bridge across the Mackinaw about five miles south of Tremont. Tazewell County also has four State Historical Markers, including one for the Riverboat Columbia Disaster of 1918 at the Pekin riverfront, and one for Fort Crevecoeur, which was the first European structure built in the future Tazewell County in 1680. The StoryMap also traces the path of the old Springfield-to-Peoria state road, a stage coach route that the Illinois General Assembly established as an official state road in Feb. 1827, just a month after they had formed Tazewell County. The route is now known as Springfield Road, though it has been a long time since it has gone all the way from Springfield to Peoria. One fascinating historical detail is that Abraham Lincoln once owned land along Springfield Road in Tazewell County. Even after the State Bicentennial Year concludes on Dec. 3, 2018, the StoryMap will continue to be available as an educational resource. The Tazewell County Historical StoryMap may be viewed HERE. 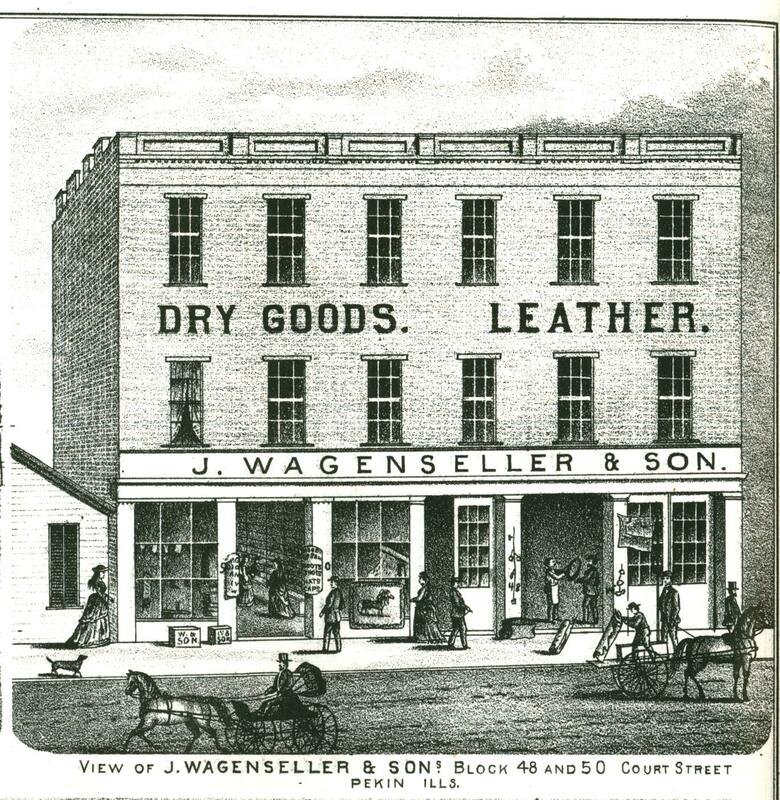 This is a slightly revised version of one of our “From the Local History Room” columns that first appeared in March 2013 before the launch of this weblog, republished here as a part of our Illinois Bicentennial Series on early Illinois history. In the “From the Local History Room” column that ran March 9, 2013, we recalled the story of the old rivalry between Pekin and Tremont as the two communities contended for the honor and status of being the governmental seat of Tazewell County. It was due largely to that struggle that Tazewell County acquired its present geographical boundaries. As we noted previously, the county originally was much larger than it is today. 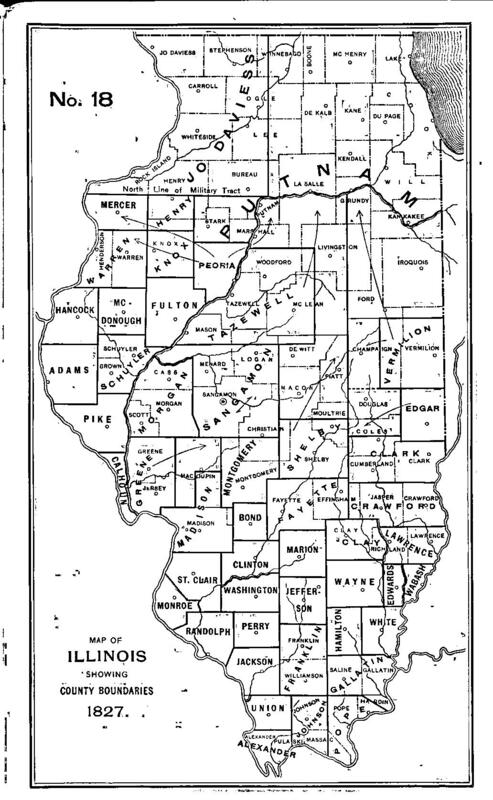 The county boundaries of Illinois as they stood in 1827 are shown in this map from the State of Illinois’ 1991 booklet, “Origin and Evolution of Illinois Counties.” Originally, Tazewell County also included all of Woodford, over half of McLean, and parts of Mason, Logan, DeWitt, and Livingston counties. This booklet presents the development of the counties of Illinois beginning in 1790, when the land that would become the State of Illinois was a part of the Northwest Territory. In that year, there were only two counties in Illinois: Knox County (not to be confused with today’s Knox County which borders Peoria County on the west), which included most of the eastern half of Illinois and parts of Indiana, and St. Clair County, which took up about the southwestern third of Illinois. The Illinois River served as the northwestern boundary of St. Clair County and part of the northwestern and western border of Knox County. Most of present Tazewell County was then a part of Knox County, with about a fourth of Tazewell including in St. Clair County. By 1801, Illinois was a part of the Indiana Territory, and the county lines had been moved, with almost all of Illinois (including the future Tazewell County) encompassed by St. Clair County. The southern quarter of Illinois was assigned to Randolph County. Knox County, however, was almost edged out of Illinois altogether. Most of Knox County was in Indiana, and just a narrow strip along the eastern border of what would become the State of Illinois was all that remained of Knox in Illinois. Eight years later, in 1809, Knox County was no more – Illinois had but two counties, Randolph in the south and St. Clair in the north. In only three years, however, the territorial counties had been re-envisioned, with the southern quarter of Illinois divided among St. Clair, Randolph, Gallatin and Johnson counties, and the northern three-quarters of the territory (including Tazewell) assigned to Madison County. Apart from some border adjustments of the southernmost counties, that basic arrangement remained until 1815, when two new counties were created: White County in southern Illinois, and Edwards County, which was formed out of the eastern half of Madison County by drawing of straight north-south line right through the middle of the Illinois Territory. The remaining territory of Madison County included the area that would later become Tazewell County. By 1817 – just a year before Illinois became a state – the northern three-fourths of the Illinois Territory were taken up by three large counties: Crawford County in the east (which was most of the former Edwards County), Madison County in the west (which was most of the former Madison County), and a new county named Bond, created by slicing a perfect north-south strip from Madison County. Most of Tazewell County was included in Bond County, while the western part of Tazewell was in Madison County. The western border of Bond County passed right through the future site of Pekin. Four years later, in 1821, the fledgling State of Illinois redrew the county borders in the northern three-fourths of its territory, reducing Bond County to a tiny rump of its former area and creating several new counties. One of them, Sangamon County, extended from Sangamon County’s present southern border as far north as the northern border of Putnam County at the Illinois River. 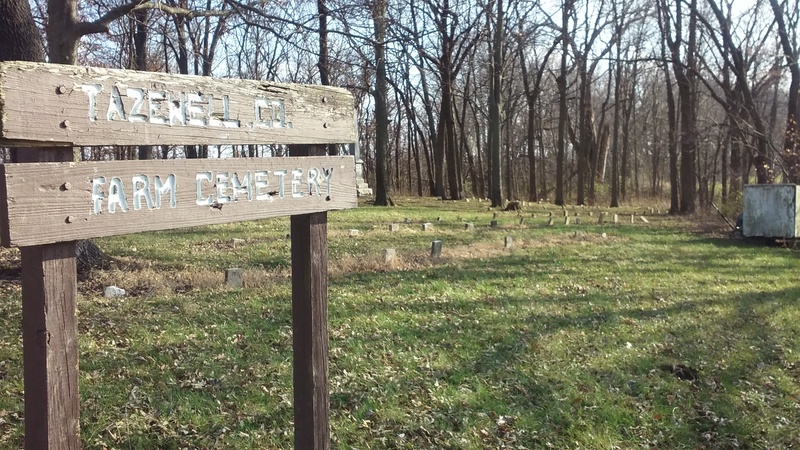 Within Sangamon’s boundaries was the future Tazewell County – and in the summer of 1824, along the northwestern border of Sangamon County at the Illinois River, Jonathan Tharp built his log cabin where the city of Pekin would later arise. In 1825, Sangamon County was reduced in size, with its northern half being separated from Sangamon and administered from the newly created Peoria County. This unorganized territory was not a part of Peoria County, but it also was not a county in its own right and was administered from Peoria. Finally, on Jan. 31, 1827, the State of Illinois created Tazewell County out of lands that not only included the whole of the present Tazewell County, but also encompassed territory from the former Fayette County (which territory is today the western half of McLean County) as well as the whole of the future Woodford County and parts of Mason, Logan and De Witt counties. Tazewell’s first reduction in size came with the creation of McLean County on Dec. 25, 1830. At that time, Tazewell acquired most of its current eastern border. Tazewell’s territory then still included a good part of what would become Woodford and Mason counties as well as a northern slice of the future Logan County. Tazewell County would retain that shape and size for much of the following 10 years, after which the Pekin-Tremont rivalry reduced Tazewell to its permanent boundaries.